It’s simply not enough to publish post after post and earn traffic through organic search, social media marketing and ads. If your readers aren’t taking action by engaging with your posts, all of that work and traffic mean nothing. There are many ways you can increase reader engagement on your blog. In this post, we’re going to focus on a unique method that involves centering your editorial calendar around content themes. We’ll cover the steps we recommend taking to set up your editorial calendar in this way. We’ll also provide a few tips on how to take this a few steps further to engage readers even more. 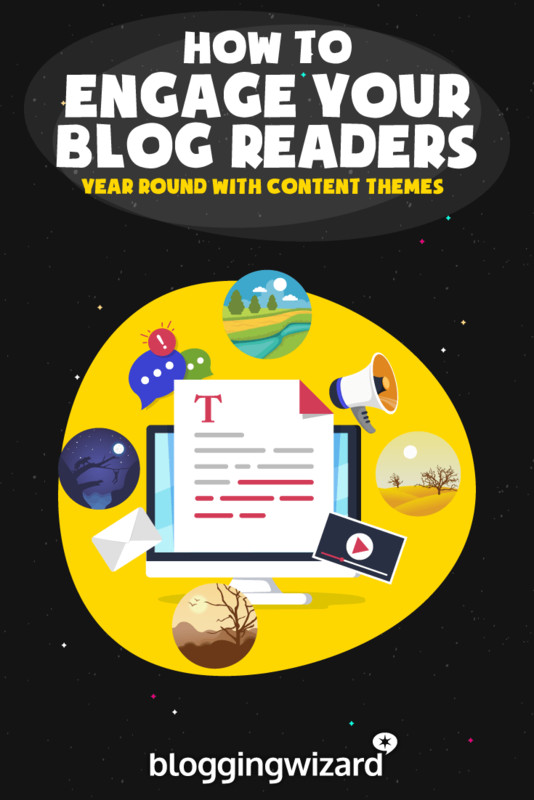 Let’s start by defining content themes and how they’ll help you engage blog readers. A content theme is a broad topic a series of sequential blog posts you publish fall under. Basically, you choose a topic to focus on for a set period of time, such as a week or an entire month. Nearly every post you publish during that time should focus on that topic in one way or another. Let’s take a look at a few real-world examples of themes designed to engage a large group of people. Take Pat Flynn, for instance. 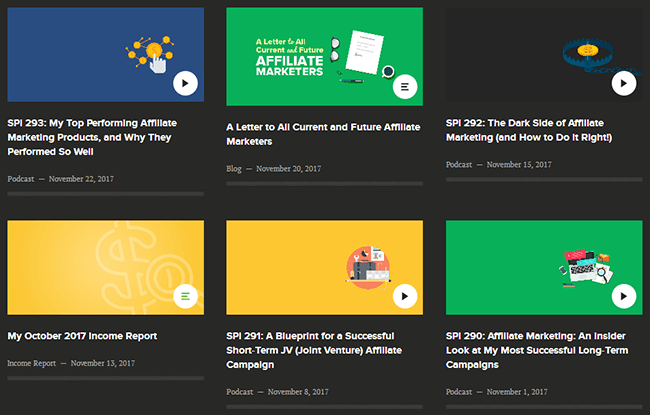 He doesn’t always use themes on his blog, but you can clearly see how most of the content he published in November 2017 focused on affiliate marketing. 12 or 25 days of Christmas events are themes as well. They’re actually one of the most widely used themes in existence. Ellen hosts an event on her talk show every year called the 12 Days of Christmas where she gives away a handful of gifts to audience members and a few lucky home viewers on 12 different days in December. A few television channels use the event to air one Christmas movie for each of the 12 or 25 days of Christmas. Some themes are centered around challenges. Take Movember, for example. Men all around the world kick off the month of November with a clean-shaven face and vow not to shave for the remainder of the month. Their scruffy faces and bushy beards are symbolic gestures that raise awareness for men’s health. 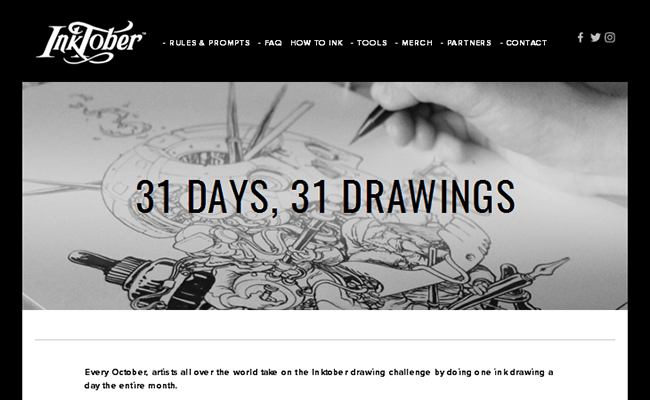 Inktober is another challenge-focused theme. Throughout the month of October, artists all around the world challenge themselves and each other by creating one ink-based drawing each day. How do content themes engage readers? Content themes engage blog readers in three main ways. For starters, they make your blog easier to follow as a whole. Let’s use that art blog as an example again. 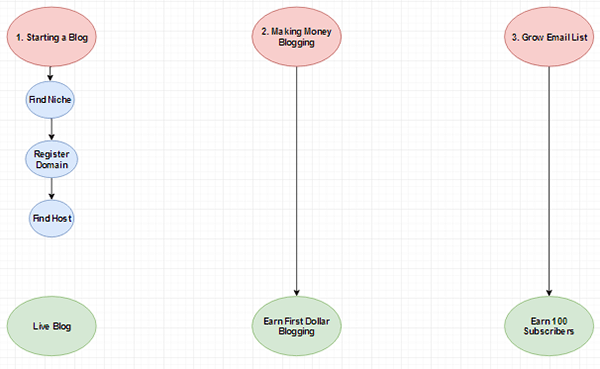 Most bloggers choose topics based on popularity, competition and their own interest. With the art blog, this would likely mean publishing a post on watercolor one week and a post on oil painting the next. Sure, they’re still interesting topics that’ll grow the blog all the same, but their readers would likely enjoy a more consistent flow that’ll help them achieve their goals in art. That consistent flow leads me to my next point. If your posts relate to and even piggyback off of one another, your reader has more of a reason to come back for any subsequent posts you publish in the weeks to come. Lastly, themes allow you to create challenges or goals for your readers to partake in and reach. They’ll keep coming back to report their progress and to see how yours and other readers’ challenges are coming along. Creating a community from your blog is one of the most effective ways you can engage blog readers on a consistent basis. The first step to succeeding with content themes is to identify your target audience. This is something you should’ve done way back when you started your blog. If not, now’s the perfect time to get it done. Think about who you’re creating content for. There’s a stark difference between the content you’d create for beginner artists and what you’d create for the experienced, for example. If you identify your target audience before you plan out your content, you’ll know exactly which topics to focus on as you’ve identified who you’re creating content for. If you already have an active blog, try running a brief survey to get a better understanding of the types of people that already exist in your audience. Once you know who you’ll be creating content for, you need to figure out which topics to focus on. Look no further than your target audience’s biggest problems. The most successful businesses provide solutions to their customers’ problems. Your job is to find out what your target audience’s biggest problems are and come up with ways to solve them. There are a number of different ways you can do this. The most effective way involves asking them directly or finding consistencies in the questions they ask you in your comments section, inbox and direct messages. You can also look outside of your audience by looking at forums, Quora and Reddit. Don’t discount keyword research, either. You can find a lot of topic ideas that way. We have an entire post dedicated to finding your audience’s biggest pain points. Be sure to check it out if you need a little more guidance. No matter which methods you use to find your audience’s biggest pain points, be sure to keep track of the number of times each pain point is mentioned. We’re going to focus on monthly content themes for the purpose of this tutorial. If you’re planning your editorial calendar for the entire year, this means you’ll need to find 12 topics to focus on. This, in turn, means finding your audience’s 12 biggest pain points. Start by using the methods we recommended for finding your audience’s biggest pain points. Our post on the topic lists six methods for you to try. You should have a fairly large list by the time you get through with the final method. Find your 12 focus points for the year. Assign a goal to each focus point. Outline a path to each goal. Use those paths to fill your editorial calendar for the year. Let’s elaborate on each of these. Start by breaking your list down to the 12 most prominent issues your target audience is facing at the moment. The most effective way to determine this is by the number of times particular pain points were mentioned. If you weren’t keeping tally, rely on keyword research instead, particularly search volume. Use a tool like Keywords Everywhere or fire up your favorite keyword tool, and turn each pain point into a searchable keyword. Record each pain point’s search volume, and organize them from highest to lowest. No matter which method you use, identify your audience’s 12 most popular pain points, and move on to the next step. If you’re having trouble finding that many pain points, consider the main concepts in your niche instead and turn them into central themes. Go through your pain points one by one, and come up with an overall goal you want your reader to reach for each one. It should essentially be a solution to the problem each pain point represents. For example, if one of the art blog’s content themes is watercolor and simply not being able to paint in this style is the pain point, a goal they may want their readers to reach is being able to paint a basic landscape in watercolor by the end of the month. You don’t necessarily need to assign a goal to each pain point, but it’ll make it easier for you to come up with content ideas. Plus, it’ll help you engage your readers throughout each theme. Just be sure you’re assigning a solution to each one at the very least. 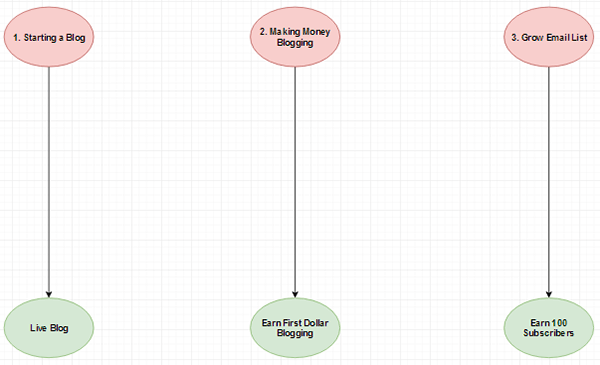 You can also use any word processor or tool that’s capable of creating flow charts. A regular text document or even pen and paper will work just as well if you want to keep things simple. Whether you want your reader to achieve a specific goal by the end of each month or you’re simply providing a solution (or several) to a problem, you need a way of getting there. Jot down each step your reader will need to take to reach the goals you’ve assigned to each pain point. If you’re not using goals, simply jot down the steps they’ll need to take to achieve your solutions. Filling your editorial calendar should be easy from here on out now that you’ve gotten all of the hard work out of the way. All you need to do is take the steps you came up with in the previous section and turn them into blog posts. The number of blog posts you need is entirely dependent on your own post schedule, be it one post a week, three posts a week, etc. It’s okay if you’re not able to dedicate an entire post to each step. Just make sure they’re mentioned at least once. You should also make sure the order in which you publish each post makes sense. If your reader needs to know about step two in order to do step three, it doesn’t make sense to publish a post on step three before you publish a post on step two. Consider your own business and blogging goals as you decide which content themes to use for particular months. For example, if that art blog plans on releasing a course on watercolor in October, they’ll have a higher chance at achieving conversions if all of their content focuses on watercolor during that month. Lastly, don’t be afraid to post non-theme related content from time to time so long as each month’s posts focus on the assigned content theme. Having all of your content focus on one specific topic every month is a great way to keep your readers engaged on a month-to-month basis. However, there are plenty of additional methods you can add to your content marketing strategy. For instance, you can create challenges you and your readers can take on as a community. The art blog, for example, could create something along the lines of Inktober where they have their subscribers create one small painting for each day the watercolor theme lasts. You can also use themes as an opportunity to capture more leads by creating lead magnets that relate to your themes’ topics. This will give you opportunities to engage readers even further through your email list. Speaking of which, you can also use your email list to engage current subscribers even further. Exclusive content is a fantastic way to do this. This could mean everything from a small fact you relay to email subscribers to an entire additional blog post available only to email subscribers. It may even be a good idea to provide updates and recaps to email subscribers as each content theme plays out. This gives you a chance to remind subscribers of any content they may have missed. To reiterate a point I made earlier in this post, blogger engagement is a crucial component of a successful blog. Without it, the chances of your audience interacting with your calls to action or subscribing to your email list are very low. By basing your content around themes on a month-to-month basis, you’ll give them more of a reason to come back every time you publish a new post. This is especially true if you create challenges, free courses and other types of content to engage them even further along the way. If you need more tips on getting your audience hooked on your content, be sure to read our guide on how to boost engagement on your blog. Lyn Wildwood is a freelance blogger for hire and avid WordPress user. She loves sharing new tips on WordPress, blogging, and online business as a whole.